From the dry pastoral belt and the mountains to tropical island luxury, the region of Mackay, offers accommodation for every taste and budget. You can relax in resort facilities beside the tranquility of the Mackay beaches, or bask in the sounds of nature at a mountain rainforest retreat. Mackay, Queensland, is much more than a southern gateway to the Whitsunday Islands. Your Mackay holidays will present lots of mainland delights and you should easily find accommodation where you need it. Best Western Marco Polo Mackay is a Mediterranean style building situated amongst lush tropical gardens, located close to the city, airport and beaches. This Mackay accommodation offers guests comfortable rooms with all modern amenities. Facilities include a spa, sauna and a saltwater pool and an on site restaurant & bar. Comfort Resort Blue Pacific located at Blacks Beach, just a 12 minute drive north of Mackay's CBD. Set amongst three acres of lush tropical gardens, this Mackay accommodation offers guests a choice of Standard Rooms and 1 & 2 Bedroom Suites. Facilities include an award winning licenced restaurant, two swimming pools, a spa, conference facilities, half size tennis court and bbq areas. Stroll the 6km of secluded beach, swim in the beautiful waters of the Pacific Ocean or relax under swaying palm trees..... The choice is yours. 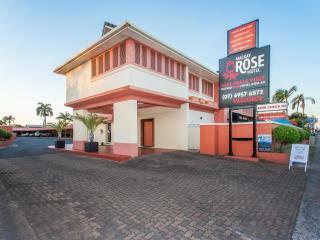 Mackay Rose Motel is close to most facilities including Mackay Airport only 3km away, hotels, shops, fast-food outlets and the CBD. The rooms at Mackay Rose Motel are airy and comfortable with modern furnishings. You can enjoy room service or enjoy a meal in the fully licensed restaurant and bar. Enjoy the resort-style pool with deckchairs and barbecue facilities or venture out to explore the local coastline and enjoy one of the many different watersports on offer in the surrounding area, including snorkelling, scuba diving , water skiing and fishing. An established hotel, Ocean International is set on pristine beachfront and surrounded by lush tropical gardens , and is only 3km to the CBD. All rooms are luxuriously appointed with sweeping views of the Coral Sea or tropical gardens from your private balcony or terrace. Facilities include a swimming pool, restaurant and bar and conference facilities. This Mackay accommodation is also just minutes to large shopping outlets, cultural facilities, the airport and sporting clubs, and is the perfect location for a family holiday or romantic escape to the Queensland Coast. Quest Mackay is located in the heart of the thriving tropical city of Mackay on the coast of Central Queensland within an hours drive of the Whitsunday Islands in the north, the Northern Bowen Basin Coal Mines in the west and is surrounded by the largest sugar farming region in Australia. Quest Mackay is an Apartment Hotel that has a mix of Studio and 2 Bedroom Apartments which are ideal for the corporate leisure or sporting group travellers. Facilities include a restaurant, outdoor pool, terraced BBQ area and undercover parking.